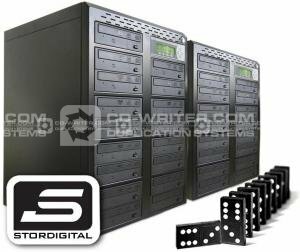 The StorDigital LinkTower X10D 60 drive expandable DVD and CD Duplicator offers the same leading technology and service as our best selling CopyTower range, with the added capability to connect multiple towers together that are all operated by a single source. Even though each tower can be operated independently, when they are connected together in a daisy chain configuration using a special serial cable, the StorDigital LinkTower X10D can link up to 10 (option for 60'000) towers together operated by a single source on the master tower. All units whether used on their own or connected are completely standalone and provide exact digital copies of CD, and DVD discs. Daisy Chain Capable: Able to connect multiple manual towers together which are all controlled by one master source for quick reliable mass production. Independent Towers: All of the Daisy Chain towers can be operated as independent towers or connected together depending on the users needs. New Continuous Hard Drive Partitioning: The HDD partitions are created without limitations using the same amount of space as the actual content size on the disc. No longer do you have to worry about loosing valuable HDD capacity because your duplicator allocates the exact space required without wasting space like standard partitions on other controllers. Industry leading 256MB buffer memory: Keeps all drives burning without pausing (known as buffer underrun) for the most stable and reliable high speed duplication - The higher the memory buffer the less likely to encounter buffer underrun errors. Optional firewire/usb add-on is limited to certain targets of duplicator only. When adding multiple Firewire and/or USB devices to the duplicator, they may be connected to a computer via a single port unless otherwise requested. StorDigital . LinkTower . X10D . 60 . Drive . Expandable . CopyTower . 20X . DVD . 40X . CD . Premium . Duplicator . Systems .